I promise, this isn’t one of those “it’s January and we should be eating nothing but beet juice” kind of posts. Actually, this has nothing to do with January or resolutions. In fact, I’ve been waiting for months to mention this. Ever since reading the book Eating on the Wild Side , I’ve been implementing several of the suggestions from it and trying to eat more of the healthiest foods described. The book looks at the history of several edible plants and how their nutritional value has changed over time. As sweeter or milder versions of fruits and vegetables have been selected over bitter or other less desirable tastes, nutrients have been bred out of those fruits and vegetables. One vegetable that hasn’t changed much, however, is garlic. Garlic, and all alliums, offer all sorts of health benefits, but specifically with garlic, getting those benefits depends on how it’s used. Garlic contains alliin and alliinase which combine to form allicin when garlic is cut, sliced, minced, or smashed. And, allicin is very beneficial to good health. However, alliinase is heat sensitive. So, if cut garlic is heated immediately after being cut, no allicin is formed. If cut garlic is left to sit for ten minutes before being heated, the maximum amount of allicin is created. Then, you can cook it as you normally do. I’ve been reordering my cooking process for every dish that includes garlic. My first step has become slicing, mincing, or chopping the garlic in whatever way needed and letting it sit for at least ten minutes while prepping everything else. Another thing I was delighted to learn from the book is that our modern cultivars of artichokes are very, very nutritious. They’re noted for having a higher antioxidant capacity than all other fruits and vegetables. They’re also high in inulin which promotes good gut microflora. And, the best part of the info about artichokes is that the hearts contain as many antioxidants as the rest of the leaves. The canned or jarred versions have all those nutrients too. I tend to choose ones packed in glass jars to avoid BPA lining in aluminum cans, but it’s great to know those marinated artichoke hearts are so healthy. And, then I read about beets. Of course beets are good for you. Everyone knows that. Wild sea beets are similar to Swiss chard, and modern beets with big roots were domesticated from them. Despite the sweetness of beet roots, they have very little impact on blood sugar. The red color in beets comes from betalains which are excellent cancer-fighting phytonutrients. And, beets contain naturally occurring nitrates which can reduce blood pressure thereby increasing blood flow to muscles. The effect has been tested on athletes, and it was discovered that after drinking beet juice, test subjects were able to exercise 15 percent longer than others who didn’t drink it. British athletes drank beet juice rather than other Olympics-approved energy drinks before competing in the 2012 Summer Olympics. I loved learning this. 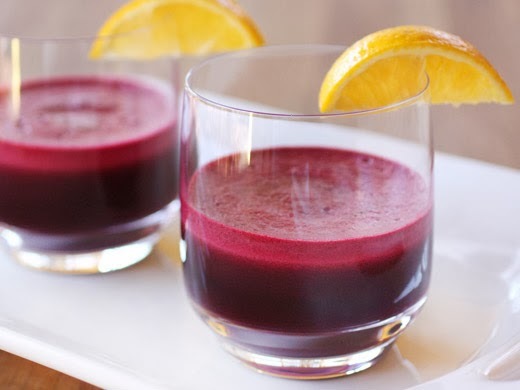 I had kept a beet juice recipe from the September 2012 issue of Food and Wine magazine, and after learning this I couldn’t wait to try it before a run. There’s always a point in the winter when it seems like we’re inundated with beets from our CSA, and this year I was ready and waiting for that to happen. I was ready to juice all the beets we received. So, on a Friday afternoon when I was tired and ready for the week to be over, I set up my juicer and set about making an energy-enhancing beverage. I started with some ginger, a peeled lemon, and then I used several spinach leaves which I had on hand. The original recipe suggests kale. Then, I added a halved and cored apple, and instead of a cucumber, I used a pear. Last, I added a couple of cleaned and trimmed beets to the juicer. The color is fabulous as anything with beets always is. And, the flavor is much better than you might think. That’s largely thanks to the lemon and ginger. Really, add lemon and ginger to any vegetable juice, and it will be delicious. But, the vegetal flavors of the beet and spinach do take a backseat here. I went for a run after drinking the beet juice and felt great. I’ll have to test the concept a few more times before I can say with certainty if it really makes a noticeable difference while exercising, but I do know it’s a very healthy and tasty drink that I’m happy to keep testing. every morning for 5 days a week i drink raw beet juice. A fabulous creation. This healthy juice must taste wonderful. I am going to have to check out that book - it sounds right up my alley. 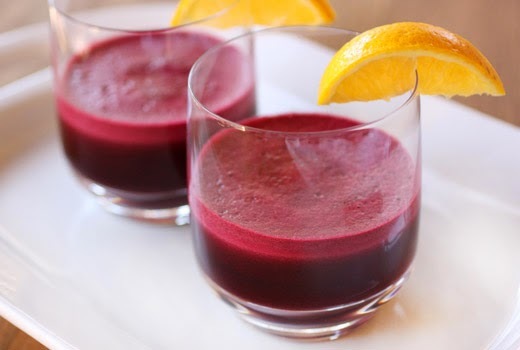 This juice looks great and really full of good for you stuff! That's a very interesting insight into garlic prep, Lisa. Thanks so much for sharing your research. Oh, and the juice looks fantastic by the way! By sheer happenstance, I almost always prep my garlic ahead of time, and it sits for close to ten minutes. I'll have to make sure that it actually is ten minutes. Easy enough to do — I'll just mince it first (yes, I'm one of those disgusting people who usually does his mise en place before I begin the actual cooking). Anyway, love the color of this. I know all about beet juice, but have never tried it. This sounds wonderful — thanks. That book is worth its price in gold just for that garlic information Lisa. I had no idea!!! There are so many things to consider when handling and cooking food. I remember in days of yore when it was thought the benefits of many fruits and vegetables needed to be boiled to the point of mush to be considered "wholesome." Kist looks at us now, raw and often sometimes delicious (as long as other factors such as where, who and when are considered:) Thanks for sharing, Lisa...Great post!!! Dear Lisa, I love learning!! It is wonderful how the Lord put all we need to keep us healthy. I try to encourage as many people I know to eat ginger, garlic etc.. Still, it never ceases to fascinate me to learn more about the food we eat and what wonderful things these fruits and veggies do for us. I am sure I would love this drink. Thanks for this very interesting info about veggies and their benefits in nutrition. 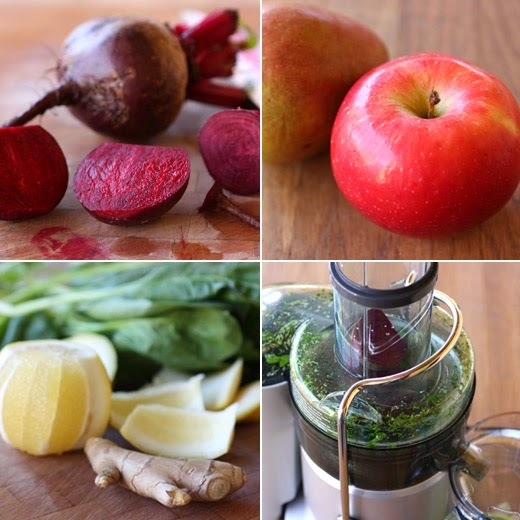 Love the combination of ingredients in this juice, specially the addition of ginger that gives a wonderful twist. Nice post Lisa...you just reminded me that I should start juicing...like this combination. This sounds great, brilliant colour too.